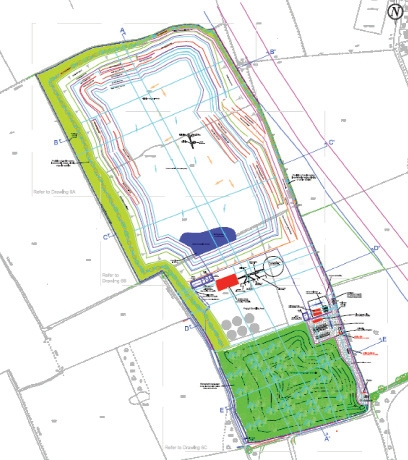 Declan Brassil & Company Ltd acted for Cemex/Readymix in the preparation and co-ordination of a Planning Application and Environmental Impact Statement for a major limestone quarry at Annagor, Duleek, County Meath. The site, extending to 37 ha, is approximately 4 km south west of Drogheda and adjacent to the M1 Motorway. The development is a greenfield development of a limestone quarry with an aggregate crushing and screening plant to supply crushed rock products to Dublin and the M1 corridor. The quarry will produce 800,000 tonnes per annum average of crushed stone products. The reserve life is in excess of 25 years. The quarry will be developed in four 15 meter benches across the length of the site to an overall depth of –15m AOD. From the first bench ground water ingress will have to be actively managed, settled and pumped off site via the motorway flood drain to the river Nanny immediately south of the site. Planning permission was granted by An Bord Pleanála on appeal in 2007. The Practice acts for many of the major aggregate producers in the Country including Lagan Cement and the Lagan Group, Irish Asphalt, Cemex, Tarmac plc, SIAC, Kingscourt Brick, Flemings Fireclays, Goode Concrete and Keegan Quarries. The Practice has acted in respect of Planning Applications for extensions of and greenfield quarries, clay and sand and gravel.